Here is my range of Kingfisher Mantis Lures from Mike Shelton and Stu Pearce (also the makers of New England Lures) from Inverell. These are all timber which they stopped making about 18mths ago as production numbers required going over to plastic. Early Small Mantis from around 2000. Limited numbers made for Fishing Australia Coffs to see how they went. They then went into production and changed them a bit. They have a few sizes in the jointed Mantis. This is the largest. And a full set of the large Mantis. I hope to complete timber sets of the others but they are hard to come by. Very nice Alistair,more top lures. 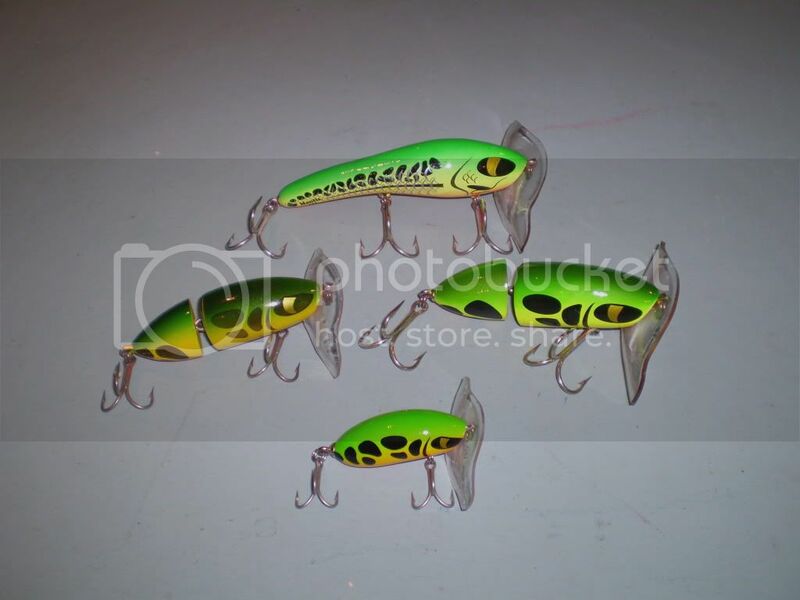 Are these made by the same guy who makes New England Lures ? Very nice presentation there Siegfried. Tagged,they are the same people,Kingfisher & New England Lures.Both the same great quality & finish. Sweet. I think those ones mounted like they are look great. If you ever have the desire to part with them please let me know so I can put them with their clothed family members. From memory you also have an early model with the original style bib? I dont know how many colours where made for FTA of those 88's , even Mike does not know so I think I have buckleys of ever expanding that range. Alistair,you have a good memory,is this the one. I picked up another few jointed ones this week plus the remaining 88's they had. your collection Alistair must be nearly complete? Not by a fair way yet. Have a couple more lined up to be picked up but I figure there must be another 15+ colour types I dont have and thats not counting the early 88's that will be near impossable to locate as they were only sold from 1 shop 10yrs ago. Have some holes to fill. Last edited by Alistair on Sat Aug 01, 2009 5:05 pm, edited 1 time in total. Alistair, they look great already,will be really something special when you fill in the gaps.